Across a range of simulations with a coupled atmosphere–ocean climate model, shifts in the intertropical convergence zone (ITCZ) are induced by an interhemispheric heating contrast. The response to heating anomalies which are polar amplified are contrasted with those which are largest in the tropics. First, we find that ITCZ shifts are always damped relative to simulations in which the ocean circulation is held fixed, irrespective of the heating distribution, keeping the ITCZ “stuck” to latitudes near the equator. The damping is primarily due to the ocean’s anomalous cross-equatorial energy transport associated with the coupling of the trade winds to an oceanic cross-equatorial cell (CEC). Second, we find that the damping effect is strongest when the forcing distribution is polar-amplified, which enhances the gross stability of the CEC and maximizes the efficiency of its cross-equatorial energy transport. Third, we argue that the ocean’s energy transport can have secondary impacts on ITCZ shifts through its interaction with climate feedbacks. 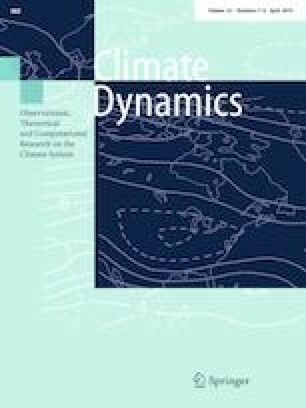 Finally, we discuss the implications of our study for our understanding of the role of CECs in damping ITCZ shifts and the atmosphere’s energy balance. This research was supported by a Grant from the National Oceanic and Atmospheric Administration. We appreciate useful comments on earlier drafts from Tim Cronin, Paul O’Gorman, Gerard Roe, Sarah Kang, and one anonymous reviewer. An earlier version of this article was published as a part of Brian Green’s PhD thesis, “Coupling of the Intertropical Convergence Zone and the Hadley Cells to the Ocean's Circulation,” © 2018 Massachusetts Institute of Technology.